If you really want the very best computer that Apple can put together – and you're willing to pay for it – then you'll be interested to know that there's a new Mac Pro on the way in 2019. Apple has confirmed that an updated version of the tricked-out, bin-shaped ultra-computer is coming down the line, but you won't be able to buy it before Christmas. We don't know any more of the details for now, but it's something to look forward to. If you were paying attention during the launch of the iPhone X last September, then you'll know that one of the ways Apple showed off the new front-facing 3D camera sensors was with some extra-realistic Snapchat lenses – masks and add-ons that really gripped the contours of your face. Well, some seven months down the line, those lenses are now available in the Snapchat app, so if you're an iPhone X user then go and get them. 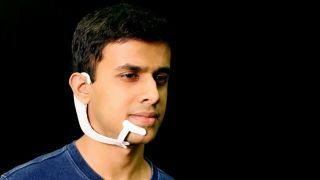 Scientists at MIT have developed a new mind-reading headset that monitors subvocalisation signals – those signals that pass between brain and mouth when you're only thinking about speaking. Apparently experts can now scan for these signals accurately enough to interpret and process them, so you might one day browse Netflix using just your thoughts (though the tech is still some way off being finished). The Google Pixel 2 was one of the best smartphones in 2017, so it makes sense to assume that the Google Pixel 3 is going to repeat the feat in 2018, and we just got our first hint that an upgraded handset is on the way. The name "Pixel 3" just got spotted in the Android source code by some eagle-eyed users, but for now we don't have any more information about it – no doubt the camera and built-in AI will once again be featuring prominently. Is this the OnePlus 6? Returning to an upcoming smartphone we know much more about, details on the OnePlus 6 continue to leak out onto the web in advance of an official unveiling (which should be sometime in the next couple of months). Today we've got another leaked image, which shows a rather large screen and a distinctive notch up at the top – does this make you more likely to want to wait in line for the phone? Or is this look already feeling outdated?